In pursuit of the mission of docomomo, as updated in the Eindhoven-Seoul Statement 2014, the theme of the 14th International docomomo Conference will be Adaptive Reuse. The Modern Movement Towards the Future: The aim is to promote the conservation and (re)use of buildings and sites of the Modern Movement, to foster and disseminate the development of appropriate techniques and methods of conservation and (re)use, and to explore and develop new ideas for the future of a sustainable built environment, based on the past experiences of the Modern Movement. 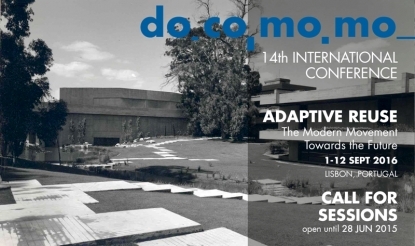 docomomo International is pleased to invite you to take part in the 14th International docomomo Conference that will take place in Lisbon, Portugal, from the 6th to 9th September 2016, under the theme Adaptive Re-use. The Modern Movement Towards the Future. In order to increase transnational and interdisciplinary multicultural approaches to the study of the Modern Movement and promote the exchange of plural and worldwide knowledge, session proposals are welcome until 28 June 2015. On 31 July chairs will be notified regarding acceptance of their session and will receive further instructions. The call for abstracts will follow. 1) Landscapes, 2) Cities, 3) Public Spaces, 4) Complexes, 5) Buildings, 6) Construction and Technology, 7) Interior Design and Furniture and 8) Theory. Please submit your session by sending the Session Proposal Form by June 28, 2015 to docomomo2016@gmail.com. The European Studies Institute of the University of Piura (Peru) and the Babeş-Bolyai University, Cluj-Napoca (Romania) invite you to the 13th «European Culture» Conference, which will take place in Cluj-Napoca, Romania between the 29th and the 31th of October 2015 at the Faculty of European Studies (Babeş-Bolyai University). The dialogue between academics, experienced lecturers and young researchers is at the core of the Conference structure. Therefore, in line with the previous editions of the “European Culture” Conference, you are invited to enrich its content with your paper which will be included in Modelling New Europe Journal (indexed in EBSCO, ProQuest, CEEOL, DOAJ, Scipio, DRJI, Index Copernicus, Ulrich) and in the online Conference Proceedings. The call for papers is now open! Ha llegado el momento para un nuevo intercambio de ideas sobre la cultura europea. Le invitamos a participar en el XIII Congreso “Cultura Europea”, que se celebrará en Cluj-Napoca del 29 al 31 de octubre de 2015. La convocatoria está abierta. Para obtener más información, visite http://euro.ubbcluj.ro/europeanculture/ . The time for a new exchange of reflections on European Culture has come. You are invited to join the XIII Conference “European Culture”, which will be held in Cluj-Napoca from the 29th to the 31st of October 2015. The call for papers is now open. For more information, go to http://euro.ubbcluj.ro/europeanculture/ . “Avrupa Kültürü” konusunda yeni bir fikir alışverişinin zamanı geldi! Sizleri 29-31 Ekim 2015 tarihinde Cluj-Napoca’da gerçekleşecek olan XII. “Avrupa Kültürü” kongresine davet ediyoruz. Kongreye bildirilerinizle başvurabilirsiniz. Ayrıntılı bilgiye http://euro.ubbcluj.ro/europeanculture/ adresinden ulaşabilirsiniz. Prof. Dr. Dr.h.c. Enrique Banús, M.A. Пожалуйста, прокрутите вниз для русской версии. wir mochten Sie mit diesem Newsletter auf den Callfor Abstracts zum Heft 34 hinweisen, das Ende 2015 erscheinen wird. Es wurde uns freuen, wenn Sie den Call auch an Ihre Kolleginnen und Kollegen weiterleiten wurden. Auf den ersten Blick konnen Wohnhauser, Parks, Museen, Brucken, Ein- kaufsstraBen, Platze und Garten mehr oder weniger klar als „Gebaude” oder „Freiraum”, als „Architektur” oder „Landschaftsarchitektur” aus- gemacht werden. Das spiegelt sich bis heute auch in den Bezeichnungen des Berufs, der Berufsverbande und der Studiengange wider. Schaut man sich allerdings Architektur und Landschaftsarchitektur genauer an, ist es manchmal schwierig, sie einem Gebaude- oder Freiraumtyp zuzuordnen. Typen scheinen in Bewegung zu geraten, sodass sich vielleicht auch be- griffliche Fixierungen lockern mussen, ohne das Feld des „Architektoni- schen” zu verlassen. Solche Architekturen werden sichtbar beispielsweise in Form von Schwellen, Hybriden, Mimesen, Inseln, Klammern oder der- gleichen. Wolkenkuckucksheim sucht fur das Heft 34 Zwischen Architek- tur und Landschaftsarchitektur Aufsatze, die sich diesem Thema widmen. Das Heft wird von Sebastian Feldhusen und Ute Poerschke kuratiert. meintlichen Dichotomie von antiker Philosophie bis zur Medienfassade in 21 Artikeln und auf uber 300 Seiten. Das Heft wurde von Ute Poerschke und Oliver Schurer kuratiert. With this newsletter, we would like to make you aware of the new Call for Abstracts for Issue 34, Between Architecture and Landscape Architecture. The targeted publication date is December 2015. We would much appreciate if you forwarded this newsletter to your colleagues and potential contributors. On first glance, apartment blocks, museums, shopping malls, bridges, parks, squares and gardens can be identified as either “buildings” or “open space,” either “architecture” or “landscape architecture.” This identifica¬tion is reflected in the nomenclature of the professions, the professional associations, and the academic programs. However, taking a closer look at individual projects, such classifications become more complex and the line between architecture and landscape architecture becomes blurred; pro¬jects turn out to be neither pure building nor pure open space. These clas¬sifications have become less black and white and, as a consequence, con¬ceptual determinations must loosen while remaining within the realm of the „architectonic.“ Such works of architecture could manifest themselves, for example, as thresholds, hybrids, mimeses, islands, and clamps, among others. Cloud-Cuckoo-Land invites authors to submit contributions that reflect on this topic. The issue Between Architecture and Landscape Ar¬chitecture is curated by Sebastian Feldhusen and Ute Poerschke. “You cannot have both technics and art,” is a radical claim by Adolf Beh- ne. It is radical because technological processing is an intrinsic human at¬tribute – as is artistic creation. Architecture in particular has strived to overcome the “narrow, limited and fragmentary character” of technology (Ernst Cassirer). The issue 33 “Theorizing Technology in Architecture and Urbanism” addresses this alleged dichotomy through contributions ran¬ging from early philosophy to media fagades. The issue consists of 21 artic¬les on 317 pages and is curated by Ute Poerschke and Oliver Schurer. Дорогие друзья журнала Воздушный замок! Мы приглашаем вас присилать аннотации статей для 34 випуска журнала, тема которого – «Между архитектурой и ландшафтной архитектурой». Предполагаемая дата публикации – декабрь 2015 года. Мы будем признательны за вашу помощь в рассылке данного письма вашим коллегам и другим потенциальнмм авторам. На первый взгляд, жилые и музейные комплекси, торгово- развлекательние площадки, мосты, парки, площади и сади можно отнести и к строениям, и к откритим пространствам, и к ландшафтной архитектуре. Соответствующие понятия закреплени в номенклатурных документах специалистов, профессиональних ассоциаций и учебных программах образовательних учреждений. Если же обратить пристальное внимание на авторские проекти, классификация оказывается более сложной и граница между архитектурой и ландшафтной архитектурой полностью размывается: то, что представлено в проектах, нельзя полностью отнести к постройкам или открытым пространствам. Классификация перестала бить жесткой и, как следствие, появилась необходимость расширить граници концептуальных определений, оставаясь при этом в предметной области архитектури. Архитектурными объектами, которые можно рассматривать в рамках предлагаемой теми, могут бить, например, входние пространства, гибриди, мимезиси, острова, соединяющие пространства объекти и так далее. «Воздушний замок» приглашает авторов присилать работи, касающиеся данной теми. Редактори випуска «Между архитектурой и ландшафтной архитектурой» – Себастьян Фельдхузен и Уте Поершки. Адольф Бене однажди заметил: «Невозможно сочетать и технику, и искусство». Это утверждение кажется слишком безапелляционним, так как человек расположен к технологиям ровно так же, как и к искусству. Архитектура, в частности, всегда питалась вийти за рамки своего «ограниченного, фрагментарного характера», присущего технологии Эрнст Кассиер). Випуск #33 “Теория технологии в архитектуре и урбанизме” посвящается Этой предполагаемой дихотомии и представляет работи, посвященние широкому кругу проблем, от ранней философии до современних фасадов, содержащих в себе элементи медиа. На 317 страницах випуска представлена 21 статья. Редактори випуска – Ютэ Поэршке и Оливер Шурер.